The Main Basin was the original terminus of the ship canal from Sharpness, opened in 1827. Here cargoes were transferred to smaller craft which passed through the lock and continued up the River Severn to the Midlands. The Barge Arm was also an early feature to accommodate small vessels bringing goods for local distribution. 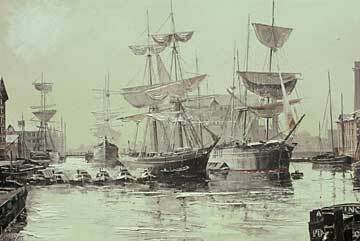 The small dry dock was suitable for repairing most of the vessels in the early days, but as larger ships came into service, a second dock was built in 1853 to cater for the largest ships that could pass up the canal fully loaded. Baker's Quay was constructed in the late 1830s by a group of local businessmen led by Samuel Baker at a time when the Canal Co. was heavily in debt and could not finance the much needed additional quay-space. The Main Basin and Baker's Quay became so busy during the 1840s that ships had to queue in the canal waiting for a place to discharge. 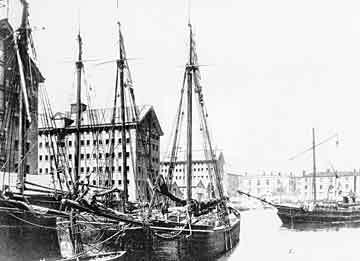 To provide more quay-space, the Victoria Dock was opened in 1849. Llanthony Quay was built in the early 1850s by the Gloucester & Dean Forest Railway Co., soon taken over by the GWR, to provide a means of supplying coal from the Forest of Dean as an export cargo. Behind the quay are some ruins of Llanthony Priory that are now looked after by a buildings preservation trust. 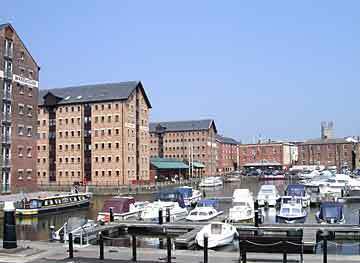 During the second half of the 19th century, much of the east bank of the canal for 3/4 mile south of Bakers Quay was developed as timber yards, with several having their own saw mills and one becoming a wagon works. Monk Meadow Dock was opened in 1892 to provide additional quay-space for the timber trade, and it was later used for receiving petroleum products. To the south of the dock, Monk Meadow Quay was built beside the canal in 1965 for the discharge of timber from motor coasters. Ships sometimes moored in the middle of the Main Basin so that salt could be transferred from narrow boats on each side of the ship at the same time. This painting by Harley Crossley, looking south from the North Quay, is based on a photograph taken in 1883. 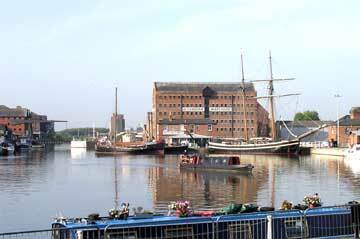 The same view in 2003 shows that commercial traffic has died out, leaving the docks available for leisure uses and the restoration of historic ships. The Victoria Dock now serves as a marina for locally based pleasure craft. The Britannia Warehouse (centre left) is a modern replacement after the original warehouse was destroyed by fire in 1987.